The Rideau Canal is 175 years young. It’s time to celebrate! There are many events taking place along the Rideau, some are annual Rideau events (made extra special by Rideau 175), some are Rideau 175 specific events. The website, www.rideau175.org, which Friends of the Rideau created in partnership with Parks Canada, contains a full listing of all the events. We’ll highlight a few in this article, but the website is well worth checking out since new events are still being added. The real Rideau keener will now get out a calendar and start penciling in dates of interest (we’ll pause here while you dig out your calendar). This will help to guarantee that you don’t miss a favourite event (by conflicting with something silly like a dentist appointment) – plus it will give you something fun to do on a cold winter day. Only a few of the highlights will be listed here, details for these and the other events are listed on the Rideau 175 website. In the immediate future are events such as Winterlude in Ottawa (Feb. 2-18, there will be a special Rideau 175 celebration on Feb. 10 at 2 pm at Dows Lake) and the Rideau Lakes Cup dog sled races in Newboro (Feb. 10-11). March 18th brings the first of the 2007 Lecture Series in Merrickville (see separate listing for this great series). In April we have the launch of some new Rideau books, some of these will also be featured at the Jones Falls Authors Festival (July 21 – see separate item on this). Plus it’s maple syrup time with the Delta Maple Syrup Festival (April 21-22) and the Perth Festival of Maples (April 28). With the latter, make a point of attending our AGM (great speakers) in Smiths Falls in the morning and then heading to Perth for some maple fun in the afternoon. Every weekend in May brings new events – these can be worked in around opening up the cottage and/or getting the boat in the water. Be sure to put May 22 in Smiths Falls on your calendar – Parks Canada will be hosting a grand celebration of the opening of the Rideau Canal. The number of events explodes in June. Mid-June (18-22) brings the steamboat flotilla, which will be puffing its way between Chaffeys Lock and Smiths Falls. Everyone should mark June 30, at the Ottawa Locks, on their calendar. This is the huge Parks Canada celebration of the Rideau (and hopefully World Heritage Status). Everyone who is anyone will be there – don’t miss it. July brings even more events, such as the Rideau 175 Heritage Weekend Festival in Smiths Falls (July 6-8), Merrickville Canalfest (July 14-15), Jones Falls Authors Festival (July 21), Smiths Falls Chocolate and Railway Festival (July 21-22), Fort Henry Military Tattoo (July 28-29) and much more. In August plan to attend the Rideau Waterway Land Trust Corn Roast at Chaffeys Lock on Aug. 4, Colonel By Day at the Bytown Museum on Aug. 6, the Community 175th Celebrations at Burritts Rapids on Aug. 10-12, the Antique & Classic Boat Show at the Long Island Locks on Aug. 11 and the Rideau Ferry Yacht Club Regatta at Rideau Ferry on Aug. 18-19. Labour Day (Sept. 1) will feature a “Tribute to Labour” at Jones Falls. A number of fairs and artist tours are also taking place throughout the month, but the biggest event is going to be the International Plowing Match and Country Festival taking place at Crosby from September 18 to 22. October features events such as the Westport Area Fall Colours Studio Tour (Oct. 6-8) and the Perth Autumn Studio Tour (Oct. 13-15). Events continue in November with a number of shows, open houses and parades. The big event will be the 5th Rideau Waterway Symposium which will be held in Kingston on Nov. 28. December brings several Christmas celebrations. We’d like to have Friends of the Rideau represented at many of the Rideau 175 events this summer. But we’re short of available bodies. If you like schmoozing with the public, now is your time to shine. Please contact us at info@rideaufriends.com or Nancy Lake at our 1 Jasper Avenue office if you would like to help represent Friends at any of this year’s events. Our 2007 AGM will be held on Saturday morning (10 am to noon, come at 9:30 am for tea and coffee), April 28, at the Rideau Canal Museum in Smiths Falls. We’ll have some special Rideau 175 treats (in addition to the normal Tim Horton’s tasty delights). Our guest speaker will be Caroline Phillips, a renown archaeologist with Parks Canada and an expert in Rideau archaeology. Her talk, Digging the Rideau, will let us know what sits underneath 175 years of debris. She’ll also be bringing several artifacts that have been recovered along the Rideau. Both Ed Bebee and Ken Watson will be there with shiny new books, hot off the presses. They’ll be happy to autograph these first edition copies. Mark Brus of the Rideau Canal Office will provide us with the very latest Rideau 175 updates. We’ll have the full array of Rideau 175 merchandise for those who wish to be mugged, chammied, pinned, shirted, hatted or otherwise Rideau 175 adorned. We also hope to have the newly revised Chart 1513 available for sale. Come out and meet some Friends! March 18 - HISTORICAL OVERVIEW by Professor Brian Osborne. Introduction to the series and overview of the history of the Rideau Canal. April 15 - THE RIDEAU ROUTE by Ken Watson. A view of the landscape of the pre-canal waterway. May 27 - THE WAR OF 1812 by Victor Suthren. The war, the troubled peace, the decision to build the canal. June 17 - BUILDING THE CANAL by Mark Andrews. Colonel By’s innovative adaptation of European techniques to wilderness construction. July 22 - BOOM CANAL YEARS by Bob Sneyd. The story of the years of great canal success and prosperity 1832-1856. Aug. 19 - ETHNIC SUBTERFUGE by Glenn J Lockwood. Social life of the Rideau corridor 1830-1930. Sept. 16 - THE ROMANCE OF STEAM by Coral Lindsay. The age of leisure steamboats and the canal's survival through troubled times. Oct. 21 - ANOTHER RIDEAU WORLD by Jonathan Moore. The underwater archaeology of the Rideau Canal. Nov. 18 - THE RIDEAU AS LIVING HISTORY by Doug Stewart. The Rideau’s 20th century evolution and its future promise. The lectures will be held in the amphitheatre of the Merrickville United Church. Ticket are only $5 per lecture ($25 for the full series). For more information, visit the MDHS website at www.merrickvillehistory.ca, or email them at info@merrickvillehistory.ca or call Gillian Gray at 613-269-4236. A number of new books are coming out in 2007. Heritage buffs will be interested in Ed Bebee’s Fish Tales and Ken Watson’s The Rideau Route (see page 6 for details). Mystery readers are going to love Locked Up, a collection of Rideau mystery short stories, edited by Sue Pike. Vicki Cameron’s Shillings is young adult mystery fiction set in 1829. Ron Corbett’s The Rideau Canal Then and Now is a full colour book featuring photographs by John McQuarrie. A new book (yet to be titled) of Rideau stories and photos by John Kessel is also in the works. For detailed info about these books, see the projects section on www.rideau175.org. We’ll have them for sale on the Friends of the Rideau website as soon as they are available. Following a delightful debut in 2006, the Jones Falls Authors Festival is back this July 21 at the Jones Falls lock station at Hotel Kenney. It's a casual affair, and it's free. Six authors of fiction and light cottage reading will be on hand to read from their latest books and talk about their work. The event takes place in one of Hotel Kenney's historic buildings. Readings start at 1:00 p.m. and wrap up around 4:00 p.m. Attendees receive a coupon for a free ice cream cone, and a chance to win one of the many splendid door prizes. Enjoy a stroll around the lock station afterwards, and dine at waterside in Hotel Kenney. There will be opportunities to talk to the authors, purchase their books, and have them autographed. We have an array of Rideau 175 merchandise that will shortly be available for sale on our website (www.rideaufriends.com) and at our 1 Jasper Avenue office (contact Nancy Lake - see our contact info on the front page). Pricing is currently being finalized - but we can tell you what is available. A “hoodie” and a t-shirt are both available with the full-sized Rideau 175 logo on the chest. A golf shirt is also available with a smaller logo on the left breast. To complement your outfit make sure you get the nice Rideau 175 ballcap. A “must have” Rideau 175 mug is available (not sure if this will be for sale on the website, but it will be available at our 1 Jasper Avenue office and at The Depot in Merrickville this summer). A nice Nalgene style water bottle (with splash guard) is available emblazoned with the Rideau 175 logo. A lovely chamois cloth, with an embossed Rideau 175 logo on it, will help keep your boat and/or car nice and shiny. And, of course you’ll want one or more Rideau 175 pins to wear and a Rideau 175 keychain. We’ll try to have all of these products available for sale at our AGM on April 28. An updated version of Chart 1513, the hydrographic chart covering the area from Kingston to Smiths Falls, will be appearing this spring. We don’t have an exact date other than it should be available before navigation season. We’ll post it on our website as soon as we have it and, if available, we’ll have this new chart for sale at our AGM on April 28. Josephine MacFadden is still working very hard, trying to create Canada’s Rideau, a TV special program. The big hurdle is finding a broadcaster, it remains frustratingly difficult to find someone willing to fund the production of this program. For more information about the project, please contact Jo MacFadden at macfadjp@magma.ca. Indispensable" - a one-word review! If you have any interest or link to North Crosby and/or Westport, then you must have this book. There are no alternatives, apart from doing without. Let me expand upon this brief assessment. In my travels, many (not all) such local histories are dusty, desiccated recitals of "begats" and bewilderingly interwoven family trees, as well as dreary lists of long-gone reeves, councillors, doctors, lawyers, ministers, and a few prominent politicians and businessmen. Cheese, lumber and mineral shipments always do well – women get short shrift. Any sense of a human and social element is ruthlessly excised. This approach to local history is so pervasive that the crime must be laid at the door of defunct history teachers and professors. Mercifully, Neil Patterson's personal work experience has inoculated him against the historian's disease. Analyses of events overwhelm the statistics that describe them; e.g., North Crosby vs. South Crosby agricultural and dairy production. He provides a sound account of the forces and events that have shaped this area. For me, the shining merit of this slender book (its worst defect to an historian, I suppose) is that Patterson cites incidents that illuminate the humanity and the trials of the people who molded this part of the Rideau Corridor. Read the story of Gabriel Forrester or the section "The Traumatic Year of 1847" to see what I mean. To balance all these positives, just let me note that there are a sprinkling of grammatical, spelling and typographical errors. I'm sensitive to this sin in others because I suffer so from it myself. To conclude, Patterson's work is certainly worth making space for on your bookshelf. The book retails for $9.95. It should be available in bookstores in Westport. We don’t currently have any copies of the book, but when we do we’ll have them available for sale on our website. As we sit here, pining for summer, thinking fondly of those dog days of August, it’s worth remembering that during construction of the Rideau Canal, August was known as the “sickly season.” The sickness was malaria, a disease not understood during canal construction, and its history in North America not remembered today. To understand how malaria affected those building the canal, one must first understand what malaria actually is. Malaria is caused by parasites of the genus Plasmodium, of which there are four different species. They all work the same way; the parasite needs both humans and a particular type of mosquito to complete its life cycle. In Ontario, a species of the female anopheles mosquito (still present) was the carrier. The anopheles mosquito is a dusk to dawn biting mosquito that will bite a human more than once, the latter feature being critical for the spread of malaria. The basic life cycle of the malaria parasite starts when a malaria-carrying mosquito bites a human. The parasites (as sporozoites) head to the liver and proceed to incubate. The sporozoites multiply and, when sufficient numbers are reached, head out to invade red blood cells and produce merozoites. These merozoites multiply and eventually burst the red blood cells, producing the classic chills and fever symptoms in the victim. It is at this stage that anopheles mosquitoes can pick up the parasites when taking blood from a human with the disease. Once back in the mosquito, the merozoites develop into male and female gametocytes. These gametocytes fuse in the mosquito’s gut (stomach) and produce sporozoites, which head into the mosquito’s salivary glands, ready to be injected into the next human victim, and the cycle starts all over again. In Ontario, winter would normally break this cycle. But one variety of malaria, a temperate form known as P. vivax, has the ability to hibernate in the liver. Some of the P.vivax sporozoites do the normal malaria cycle (infecting their hosts that year), others “over-winter” in the liver, coming out the next summer when the mosquitoes have returned, to start the cycle again. Malaria was not unique to the Rideau – it was present in Ontario as early as the 1700s. For example, in 1793, Mrs. Simcoe, wife of the Lieutenant Governor of Upper Canada, was absent from a gala ball – she was sick with malaria. There is some speculation that the great influx of Loyalists from the U.S. in the late 1700s, many of whom would have been carrying malaria, expanded the range of the disease in Ontario. At that time it was called by many names, “fever, ague, lake fever, swamp fever, intermittent fever, and fever of the country.” The most common terms were “ague” or “fever & ague.” Anyone reading period literature will see these terms commonly mentioned. 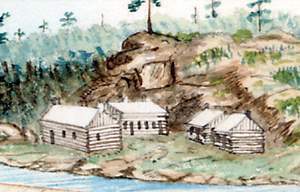 The Lock Construction Camp at Jones Falls Located at the spot now occupied by the Blacksmith’s shop at Jones Falls, these buildings didn’t prevent malaria carrying mosquitoes from entering at night. “Basin and upper lock at Jones' Falls, from the East Upper end of 3rd lock, works nearly completed” by Thomas Burrowes, October 1831, Archives of Ontario, C 1-0-0-0-55. By the time the Rideau Canal construction started in 1826-27, malaria was well established throughout much of the range of the anopheles mosquito in Ontario. However, the building of construction camps, putting dozens to hundreds of people in close proximity, in areas populated by the anopheles mosquito (whose highest numbers were in the southern part of the Rideau), meant an explosion of the disease. The summer of 1828 saw the first great outbreak of malaria in the southern construction camps. The period from August 1 to September 15 of each year became known as the “sickly season.” About 60% of the men would annually get sick with malaria. It eventually led to many men abandoning the work sites during that period of the year. Rideau Canal contractor John Redpath, in a letter written from Jones Falls on December 3, 1831, referenced malaria, stating: “the exceeding unhealthiness of the place from which cause all engaged in it suffered much from lake fever and fever & ague, and it has also retarded the work for about three months each year. I caught the disease both the first  and second year missed the third but this year had a severe attack of Lake Fever – which kept me to bed for two months and nearly two months more before I was fit for active service as nothing can compensate for the worse of health so no inducement whatever would stimulate one to a similar undertaking.” Redpath was noting that his workforce, primarily Scots and French Canadians, were all laid low by malaria. Ironically, in 1834, Redpath brought his family to his sister’s house at Jones Falls, in order to escape the deadly cholera epidemic (which killed his wife), that was raging at that time in Montreal. The mystery of malaria during construction of the Rideau isn’t that it existed (it was present in Ontario long before the building of the Rideau Canal), but that so many died from it. Today, P. vivax has essentially a 0% mortality rate because P.vivax infects far fewer blood cells than other forms of malaria. People get sick from P.vivax, but they don’t die. However the number of deaths reported from the canal construction period shows a direct death rate of about 1.5% at the lockstations, which might be extrapolated up to 3% to account for deaths off-site. We don’t have exact (or even good rough) numbers for how many people worked on the canal – but an educated guess, using the higher 3% figure, is that 375 to 600 workers may have died from malaria. This doesn’t include women and children who died from malaria in apparently similar numbers. For instance, in 1830, in the area from Newboro to Kingston Mills, out of a total of 1,316 men, 787 got sick and 27 died. At the same time, 13 women and 15 children were also recorded as having died. It appears that either the more virulent tropical malaria, P. falciparum, was also present, or that the mortality rate of P.vivax has somehow changed, or that other factors were involved. The more virulent P. falciparum was introduced into the U.S. with the African slave trade. It didn’t have the ability to over-winter in Canada, so, if it was present, it must have been re-introduced each year. John Redpath makes a distinction between “lake fever” and “fever & ague” so perhaps he was referencing different forms of malaria, or perhaps there were complications from other diseases of the period. Although cinchona bark (containing quinine) had been in use for years as a treatment for malaria, it was the invention of quinoline alkaloid (named ‘Quinine’), in 1820, that provided the first highly potent anti-malarial drug. But at the time of the building of the Rideau Canal it was very difficult to obtain and its use was therefore limited. Malaria was eradicated from Ontario by the end of the 1800s. This was done by reducing the numbers of malaria parasites to a point low enough to break the cycle (the classic case example of how this can be done was the U.S. construction of the Panama Canal). Extensive use of Quinine by the mid-1800s acted as a prophylactic for the disease (there are stories from that period of children going to school, “buzzed” on their morning dose of Quinine). The addition of glass, and eventually screens, on doors and windows, to prevent the entry of mosquitoes at night, reduced the rate of infection. Swamps were drained, reducing mosquito breeding habitat in areas of human habitation. This all took place, essentially eradicating malaria in Ontario, before it was scientifically recognized, in the late 1800s, that mosquitoes were the carrier of the disease. Mythconception #1 – malaria was unique to the construction of the Rideau Canal. No, it was present in Ontario before and after the building of the Rideau and present at similar large construction projects of the period (i.e. the building of the Erie Canal). The Rideau was not unique. Mythconception #2 – Colonel By stopped recording the number of deaths. No, records were kept for the entire construction period once malaria was recognized as a problem (1828-1831). Mythconception #3 – malaria affected Irish labourers more than other workers. No, malaria was indiscriminate, it affected everyone. One of the hardest hit places was Jones Falls, which didn’t employ Irish labourers. Direct numbers from the records show that the Royal Sappers and Miners took the hardest hit percentage wise, but the records are fragmented so no conclusions can reliably be drawn. Mythconception #4 – British soldiers who had served in tropical countries caused the malaria on the Rideau. No, we’ve already seen that malaria was present in the area long before the construction of the canal. The soldiers who worked on the Rideau Canal were Companies raised in Britain (where the temperate form of malaria existed in marshland regions). Yes, a few could have been infected with tropical malaria from previous postings – but their low numbers were not sufficient to start up a malaria cycle. The bottom line is that malaria was the single largest cause of death during the construction of the canal. The Rideau Canal, similar to other “megaprojects” of the period, is a monument to human sweat, toil, death and perseverance. It’s well worth celebrating since civilizations were built on such projects and the building of the Rideau Canal helped Canada advance into nationhood. Note: While malaria isn’t a problem in Canada today, it kills over 1 million people worldwide every year, mostly in developing nations. Most of the deaths are caused by the species P. falciparum. In “Fish Tales #8, (Fall 2006), I introduced Captain Nanny and the Sayer family, 1890s tourists from Warwick, NY. The Sayers were major US suppliers of apple brandy (“applejack”). People from the Warwick area began coming to Battersea, lured by the fishing and the unspoiled beauty. The “Applejack Gang” was the nucleus of a 1920s poker club back in Warwick, led by Cornelius “Nealy” Lazear. No prizes for guessing that they were called the “Applejack Gang” because they always brought gallons of applejack. A loose-knit group, they were hosted by Chris and Lottie Lake at the Granite House. When they arrived at Battersea, the Gang had dinner and then met their guides in the large living room of the Granite House. The guiding parties were usually the same year after year. Business done, the Gang played cards until the wee hours of the morning, had breakfast at 6 am, and – off to Dog Lake! Bass fishing occupied the morning. A group shore lunch at Applejack Point was prepared while the Gang caught up on sleep – it was impossible to sleep at night. If you did try to sneak off to bed while the card games were going on, you would be rousted out and dragged back downstairs. One day the skies opened up and they had to fish all morning in the rain. It was pouring so hard that the guides couldn’t cook outside. No problem – back to the Granite House where the guides took over the kitchen. While all this was going on, the gang warmed themselves with hot toddies. By the time Jack Hanley’s famous fish chowder was ready, the clients were feeling no pain. On a memorable trip, the two Toms were fishing with Lloyd Knapp. They decided to call it a day and head back to the dock. Lloyd started up and made a quick turn. Tom Welling was a bit unsteady – he and his friend had been “imbibing” (to put it delicately). Welling was pitched from the boat. He couldn’t swim and when he hit the lake he swallowed a lot of water. Fortunately he had on layers of clothing – it was fall – he floated and was dragged into the boat by Lloyd and Tom Lawrence. The “Applejack Gang” broke up when Nealy Lazear died, although former members kept coming up. Some of them built cottages around Applejack Point – the families have become long-standing members of the Battersea summer community. 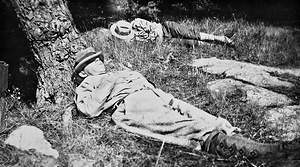 The picture shows Gang members catching up on sleep. If you like Ed’s “Fish Tales” (and who doesn’t!) - you’re going to love his new book “Fish Tales: The Lure and the Lore of the Rideau.” A follow-up to his 2004 hit “Pathfinders: The Guides of the Rideau,” Fish Tales will have more social history, covering the 1890-1960 era, with an emphasis on stories. It will appear in print this spring and we’ll feature it on our website as soon as it is available. Ed will also be pleased to sign copies of the book at our AGM on April 28. When not being distracted with doing things such as a Friends of the Rideau newsletter, Ken Watson is working hard to complete his new book “The Rideau Route: Exploring the Pre-Canal Waterway.” The book will take the reader on a 1783 canoe trip along the Rideau Route, describing what the area looked like prior to the flooding by canal dams. Maps and transcriptions of the first three Rideau Route surveys are also included. It will appear in print this spring and we’ll feature it on our website as soon as it is available. Ken will also be pleased to sign copies of the book at our AGM on April 28. When the Rideau opened in 1832, the sluices and gates at the locks were ready to receive vessels, but how about marking the route between them? The first responses were quite primitive, albeit effective. The “low marshy lands” in the estuary of the Cataraqui at Kingston were particularly difficult to negotiate. In 1834, Edward J. Barker reported that the channel was marked by long poles stuck in the mud, but “so imperfectly, as to render it almost impossible to run this part of the route during the night, unless the moon shines brightly.” Further along, the drowned lands were no problem. There, the cleared channel was marked by the line of standing trees, complemented by stakes driven into the ground, and by marks on the trees. His successor, Phillips, concurred that the buoys were inadequate because they were carried away every spring by the melting ice. Accordingly, he recommended a simple, well-tried, and inexpensive solution: a series of cedar bushes wired to poles driven into the mud. According to the pilots, these were “more easily seen at night than any mark or beacon that we have had yet.” In 1908, Capt. Noonan offered to erect 52 poles and cedar bushes, which would last for 3 to 4 years, for $325. Another initiative was lighting. Initially sperm-oil lights marked the locks but, by 1864, local pilots complained that they were useless and wanted them removed, a complaint repeated in 1894. However, in 1907, the Department of Marine and Fisheries offered to install 40 lights between Burritts Rapids and Smiths Falls. Phillips accepted the offer and suggested that the proposed tripod-mounted lights have red glass on the shoal side and white on the channel side. The following year, 48 persons signed a petition for similar improvements along the 16-mile channel between Kingston and Washburn. Much to their chagrin, they were informed that the DMF only intended buoying those portions of the Rideau channel used at night by the Rideau Lakes Navigation Company. Nevertheless, the installation of navigational lighting moved ahead. By 1915, the DMF maintained 133 red and white tripod lights between Burritts and Kingston, but with ubiquitous “bushes” often used in sections between them. However, with the reduction of pleasure traffic in WWI, only the Smiths Falls-Kingston section was lighted, with the number being reduced to 58, and finally discontinued in 1920. With the channel at last marked clearly, all that was needed were good charts. But that’s another story. The Clean Water Act, first introduced on December 5, 2005, was passed and made into law on October 19, 2006. The Act allows conservation authorities to work closely with municipalities, farmers, landowners and other stakeholders to protect municipal sources of drinking water from contamination and overuse. It should be an excellent tool that the many Rideau environmental groups can use to help protect the quality of Rideau area waters. Specific details on how the Clean Water Act is to be implemented will be outlined in regulations to be introduced in early 2007. Our beloved Black Rat Snake is now officially known as the “Eastern Ratsnake.” It is still a threatened species in Ontario, although the population of this snake in the Frontenac Axis (Rideau lakes region) is quite healthy. These snakes are harmless, they eat mostly bird eggs and small mammals (such as mice). So if you see one, please leave it alone.